2010 Toray Gold Medal: Masanori Iye's 2010 Toray Prize in Science and Technology. This award recognizes two Japanese people annually for their outstanding achievements in the fields of science and technology. Winners receive a gold medal and a supplement of 5 million yen. For the 2010 award, 29 candidates received nominations across numerous scientific disciplines including physics, chemistry, engineering, biology, medicine and natural sciences. "I am extremely pleased and excited to learn that a candidate from astronomy was one of the two recipients," said Iye, who is also a faculty member of the Subaru Telescope and the Optical and Infrared Astronomy Division of NAOJ. "I hope this award and recognition will help to realize our ambition to build TMT." Two key aspects of Iye’s work contributed to his selection for the prize. First, Iye has conducted groundbreaking research on the early universe – the "cosmic dawn," as he put it. Iye has discovered some of the youngest and therefore most distant objects on record, including in 2006 a galaxy nearly 12.9 billion light-years away. Second, Iye has spearheaded the development and construction of what's known as a laser guide star adaptive optics system for the Subaru Telescope in Hawaii. The best ground-based telescopes in the world use such systems to compensate for the image-blurring effects of our planet's atmosphere. As part of this setup, a superbright laser creates an "artificial star" to serve as a reference point in the sky when studying distant, dim objects. On the adaptive optics end of things, precisely calibrated electronics actively deform a special mirror to cancel out atmospheric disturbances. Overall, Iye said that the recent additions have "enhanced the Subaru Telescope's vision by a factor of 10." It is this sort of work by Iye that makes NAOJ a key partner in the TMT team. NAOJ, together with qualified industries, has successful manufacturing experience building giant observatories, such as the Subaru Telescope. Designing and assembling telescopic structures and drive, crafting sensitive astronomical instruments, and molding and polishing special glass ceramics that will fabricate TMT's segmented primary mirror are all areas in which Iye and his team are planning to make key contributions in realizing the ambitious TMT project. "On behalf of the entire TMT team, let me congratulate Masanori Iye on receiving this prestigious award – it is very well deserved," said Ed Stone, the Caltech David Morrisroe Professor of Physics, and Chair of the TMT Board. "We welcome Japan's collaboration and look forward to Masanori's continued scientific leadership in realizing this important project." TMT is the next-generation astronomical observatory that is scheduled to begin scientific operations in 2018 on Mauna Kea, Hawaii. 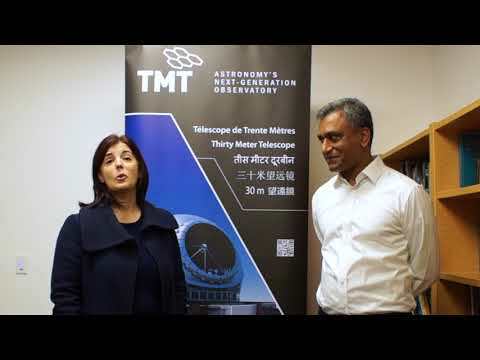 The TMT project is an international partnership among the California Institute of Technology, the University of California, and the Association of Canadian Universities for Research in Astronomy, joined by the National Astronomical Observatory of Japan, the National Astronomical Observatories of the Chinese Academy of Sciences, and the Department of Science and Technology of India.